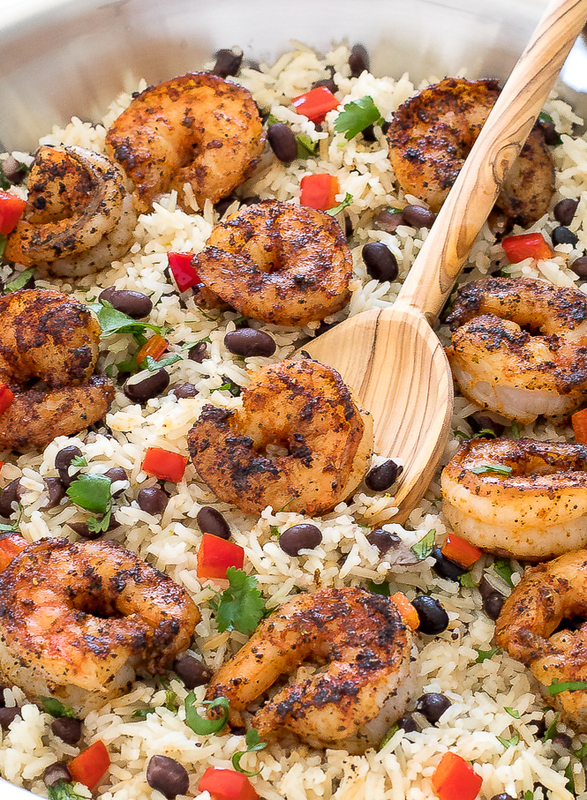 Cilantro Lime Shrimp and Rice. 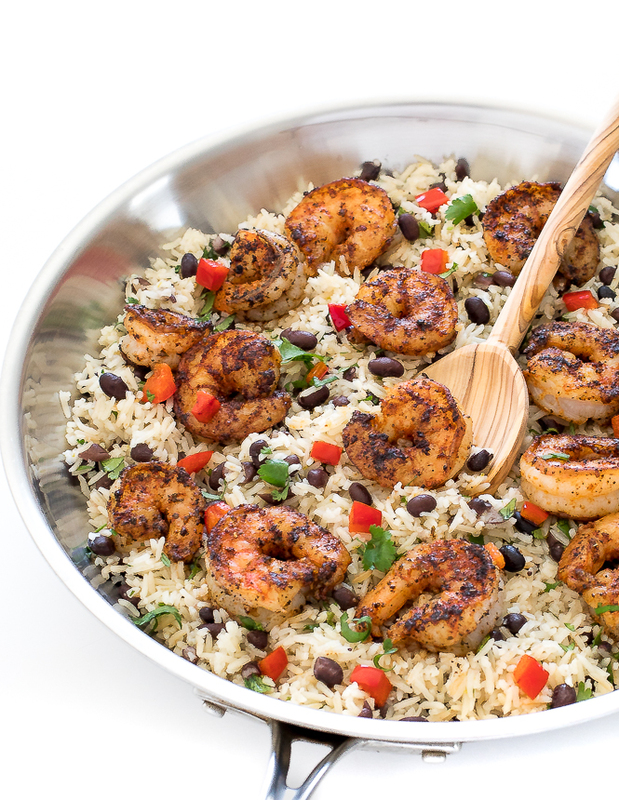 Blackened shrimp served with a flavorful cilantro lime black bean rice. Super easy everything is made in one skillet! I love one skillet meals. They are so easy to throw together and means less cleanup. 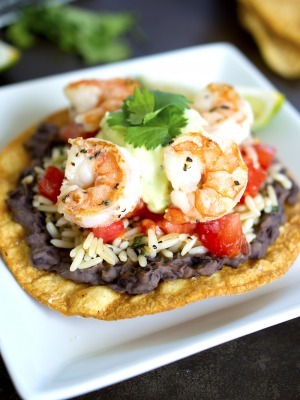 This Cilantro Lime Shrimp and Rice comes together in under 35 minutes! This cilantro lime rice is loaded with black beans, fresh cilantro, lime zest and lime juice. The rice gets topped with spicy blackened shrimp and sauteed red bell pepper. It is so delcious and flavorful! Start by making your Homemade Blackening Seasoning and tossing your shrimp in it. Heat a large skillet with olive oil and saute shrimp until pink and firm, 3-4 minutes. Remove from the heat and set aside. Add more oil and butter to the same skillet and add in the rice and garlic. Saute until golden brown them add in stock. Simmer until tender. Once the rice is cooked add in lime zest, lime juice, fresh cilantro and black beans. 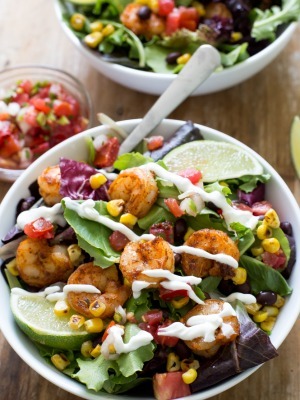 Toss together with the shrimp and bell pepper and serve immediately! If you love one skillet meals like me you would love these one pan recipes! Mix together the blackening seasoning in a small bowl and set aside. Toss the shrimp in the seasoning. Heat 1 tablespoon of oil in a large skillet. Add in the bell pepper and saute for 3-4 minutes or until tender. Remove from the pan and set aside on a plate. Add in the shrimp to the same skillet and cook in two batches until firm and fully cooked, 3-4 minutes. Set aside with the bell peppers. Heat 1 tablespoon of olive oil and 1 tablespoon of butter in the same skillet that the shrimp were in. Add in rice and saute until golden brown stirring frequently so it does not burn. Pour in chicken stock and bring to a boil. Reduce the heat to low and simmer covered for 15 minutes or until all the liquid is absorbed and the rice is tender. Add lime zest, lime juice, cilantro, black beans and the shrimp and bell peppers to the rice. Toss to combine and season with salt and pepper to taste.